I came to county listing quite innocently, at least in my mind. After college, I spent my summers doing surveys for the now published 2nd Breeding Bird Atlas in Pennsylvania, honing my earbirding skills so I could identify any breeding species by hearing just a snippet of their song. (Hint: If you really want to learn your bird songs, spend a couple summers out in the field, seven days a week practicing…) This job took me all over my state and to many areas I had never visited before. I was a very casual birder until college because I just didn’t realize that there was something besides casual birding. Remember, this was before Facebook. I initially used an Excel spreadsheet (and then Google Docs) for a long time, but this was tedious and it made it hard to target species that would add to my county lists. I always toyed with buying Avisys, but just never took the plunge. Most of these sightings went into eBird as well, but my personally calculated county ticks number and what eBird told me I had were very different numbers. At some point, the eBird upload process became easy enough that I converted the 2,500 point count surveys I did across Pennsylvania into the appropriate format and uploaded them to my account, instantly adding several thousand county ticks to my eBird account. At that point I was really hooked and since then I have used eBird as my official lists keeper. With all of my records on eBird, I could now take advantage of various new technologies as they were introduced. This of course includes the eBird Alerts that alert me to reports of species I don’t yet have in the counties I have signed up for. I generally subscribe to the counties I have lived in, as well as surrounding counties of my current home. You can also sign up to get alerts for species not on your year list for any region, but that’s not much help for county ticks lists. Barcharts for some of the birds I still need to find in Susquehanna County, PA. The most recent development that has really made county listing easier is the ability to link your eBird account to the new BirdsEye app for iPhone, which I consider to be the ultimate county listing tool. The new BirdsEye makes it simple to load any of my year or life lists from eBird, and see nearby sightings of birds that are not yet on my current list. 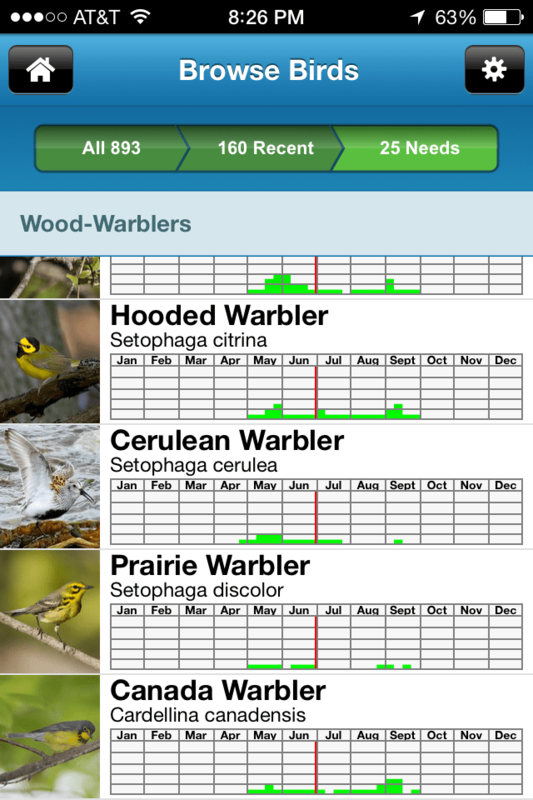 With barcharts for local abundance, it is easy to tell at a glance which birds I have a reasonable chance of finding. I have been working for quite some time to reach 5,000 ticks in Pennsylvania. In many respects this is not much of a challenge since that averages less than 100 birds in each of the 67 counties in the state. It is simply a matter of visiting enough of the counties during the right times of year to be able to see a diverse set of birds in a short amount of time. However, I now live in New York and have to take advantage of any opportunities to bird in new areas of Pennsylvania. As luck would have it, this year’s annual Pennsylvania Society for Ornithology meeting was set for the northeastern corner of the state, at the border of two counties. I had briefly birded one corner of Luzerne County but had never recorded a single species in Lackawanna. I was only about 200 birds short of my goal and was hoping that my trip and full weekend of birding in a new area would allow me to reach it. By dutifully submitting eBird checklists on the field trips I led (live from the field with BirdLog! ), and keeping track of some incidental sightings (hooray for BOY Common Nighthawk that flew over a large group of us at the conference center!) I was able to keep track of exactly which birds I still needed to fill in my county lists, and where they had recently been spotted. By the end of the meeting, I was only a couple short and was able to stop in another new county for me on the way home to reach my 5,000th County Tick. Knowing at any point exactly which birds have been seen nearby that I still needed for my county lists was nothing short of incredible. eBird and the apps based on eBird sightings have created an environment where I can spend more time out in the field, and less time at home looking through my lists to nail down which birds I still need and where to find them. I can spend more time watching the behavior of every bird I find, and learning the habitat associations that help me find birds when I am out birding in a new area. Seeing a patch of willows along a stream surrounded by pastures, and knowing just by glancing at it that I can probably find Baltimore Orioles with just a few minutes of listening, or that I can walk along that hemlock shaded stream for a couple miles and surely encounter Louisiana Waterthrushes, is knowledge picked up over hundreds of encounters with these birds and those habitats. Anything that gives me more time to make those connections is priceless, especially when I find myself too busy to bird every day like I could when I was in school. And that is what county listing is all about for me. Sure, I am making more lists, but the fun is in applying everything I have learned about a bird and its habitats in one county to find that same bird when I find myself in unfamiliar terrain. For me, the birds are driving my lists, rather than my lists driving me to bird. How do you keep track your of lists and has it changed over the years? Drew Weber is an ornithologist originally from PA but now living in central New York. He is finishing up a master's degree at Penn State University on grassland bird conservation. Drew is active in the Pennsylvania birding community as chairman of the bird records committee, serves as a board member for the Pennsylvania Ornithological Society and is a reviewer for sightings submitted to eBird. His passions include figuring out how new technology can be used for birding, introducing people to birding and getting more people to use eBird.